Able to humidify and pressurize for both or either sides of test specimens. 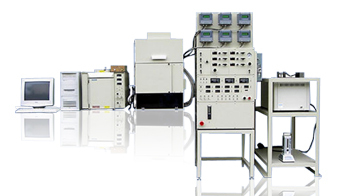 This system complies with ISO 15105-2/JIS K7126-B. It uses an equal pressure method and keeps both sides of films humid. It measures the gas permeability coefficient of H2, N2, O2. It injects the permeate of gases into the columns of a gas chromatograph, separates them into each component, and measures the permeation of each component. Highly appropriate for evaluation of fuel cells’ proton exchange membrane.